One of the cheapest unli call promo from Globe is the GoUNLI20 that gives you unlimited calling for only 20 pesos. If you need to call someone about important matters and don’t want spend your regular load, then this is the right offer that you can subscribe using your prepaid account. Instead of regular calling rate, you can convert your P20 into unlimited call to any Globe/TM mobile numbers for one day. 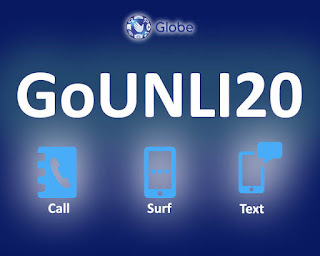 There’s more with GoUNLI20, you can also browse to the internet with its free 15MB of data for chatting and surfing plus 20 texts that you can use to connect with your friends who uses another network SIM card. You easily subscribe to this promo by sending the keyword or by dialing *143# USSD code menu on your phone. Use the format below as your reference. Which offer is better for you 20 pesos? Compare this promo to Smart All Out Surf 20 - offers call, text and data for 1 day. Just directly dial the 11-digit Globe/TM mobile number. If you have enough points, you can also claim or redeem GoUNLI20 Globe Rewards ITEMS lists. You need P1 maintaining balance to use this service. Wait for the SMS confirmation from Globe that says your promo is already active and ready to use. To check the status of this promo, text GOUNLI20 STATUS send to 8080. If you want to stop, you can also text GOUNLI20 STOP send to 8080.